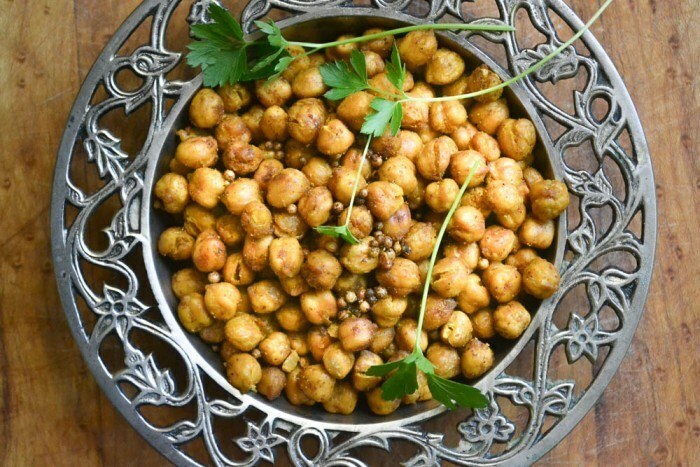 Tandoori Roasted Chickpeas are an easy high protein appetizer or snack ~ once you start popping these little guys you won't be able to stop! Drain and rinse the chickpeas well. Lay them out on a clean kitchen towel or paper towels to dry. Toss with the rest of the ingredients and spread out on a baking sheet. Bake the chickpeas for about 30-35 minutes, stirring, or shaking the pan several times during the baking. Be careful, occasionally the beans can spit and even explode as they cook. Let the beans cool slightly on the pan, and then serve up while they are warm.